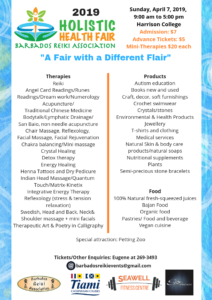 Stress relief, overcoming trauma, and art therapy – these are just some of the items on the programme for the Barbados Reiki Association’s Holistic Health Fair (HHF). The HHF, returning to Harrison College for the sixth consecutive year, will be held on Sunday April 7th from 9am to 5pm. The fair also includes booths focusing on biodiversity, green living, and much more. Healing therapies such as Reiki, reflexology, energy healing, detox therapy, angelic healing, massage, and natural skin care will also be on offer. But that’s not all. This year, the HHF will be opened by Sir Trevor Austin Carmichael, KA, LVO, SCM, QC. After that, the HHF will offer an experience for the whole family, including attractions for younger people. With a petting zoo, a storyteller and fun workshops, there’s something for every family member. There’s a full programme of talks and demos running throughout the day including martial arts, mini me family yoga, and sound healing. We have also added a very important feature to the fair; a breast screening programme will be available from 11 a.m. – 3 p.m.
“We’re particularly proud of this year’s slate,” says Ms. Holder. “It includes presentations on trauma release, meditation and other healing modalities. 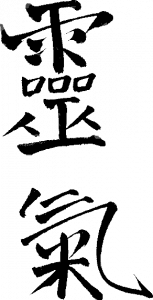 There will also be interactive demonstrations of karate, Tai Chi, and line dancing “. The HHF will also feature art and creative workshops run by winner of the 2017 NIFCA Governor-General’s Award for Excellence, Linda Deane. As always, healthy food and drinks will be on sale throughout the day. This year, the HHF has been sponsored by Tiami Catamaran Cruises, Seawell Fitness Centre, and Sign Station Barbados. There has also been support by the National Cultural Foundation. Admission to the 2019 Fair remains at $5 for advance tickets and $7 at the door, with the price per therapy capped at $20 to allow patrons to enjoy several therapies.